Has rainfall increased or decreased with rising temperatures? NCDC Daily contains the raw precipitation measurements from about 100,000 weather stations back to 1780. I put my computer (iMAC-i7) to calculate this , but it took a week of CPU time! Here are the results as compared to temperature anomalies. Top graph is the change in the global annual average daily rainfall compared to a 30 year ‘normal’ value from 1961-1990 (i.e. Rainfall Anomaly) . The bottom graph compares this global average rainfall anomaly to the global average temperature anomaly (CRUTEM4 in blue) and my GHCN-DAILY in green. Since 1975 global average rainfall on land has increased by about 1mm per day while simultaneously land average temperatures have risen by 1C. However, it appears that rainfall was equally high during the 19th century. The calculation is similar to that used for GHCN-DAILY temperatures. Where possible I calculate for each station a normalised monthly rainfall between 1961-1990. I then use a 5 level icosahedral grid for averaging and also calculate the average (normal) monthly rainfall within each bin between 1961-1990. It is very interesting to view how this ‘normal’ daily seasonal rainfall looks on a 10242 node icosahedral grid. It shows beautifully how rainfall follows the sun. It may seem counter-intuitive but on average there is more rainfall during the summer months, than in those damp cold winter months. Ocean surfaces warm during summer months, thereby increasing evaporation which then drives rainfall. The NCDC monthly rainfall ‘anomalies’ are plotted below. 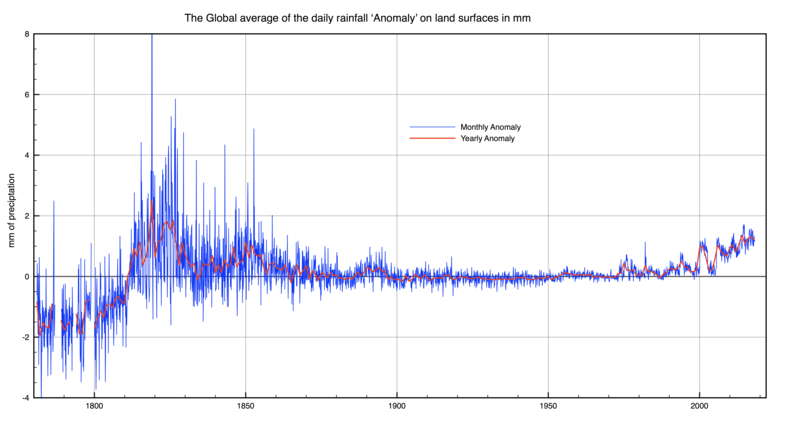 The Global average daily rainfall ‘anomaly’ on land. Could the observed increased rainfall between 1810 and 1870 perhaps be due to two extremely large volcanic eruptions – Tambora (1815) and Consiguina (1835)? There is also a smaller rainfall peak immediately following Krakatoa (1883). In general though a warmer world is a wetter world. Fantastic work by that CPU, and the person who programmed it. Rainfall follows the sun with plant photosynthesis and transpiration. The supply of moisture to the atmosphere is dominated by plants. You must be referring to moisture other than ocean evaporation, which is almost 90% of water vapor. Evaporation is thermally activated with an Arrhenius rate law. The variation in rainfall I suspect would vary by a fraction E/kT^2 for every delta T in temperature. The amount of rainfall between 1810 and 1860 seems very unrealistic. Perhaps the quality of measurement is low before 1900. But as indications the variations of 18th and 19th century is interesting. Thank you for a great work. Yes. 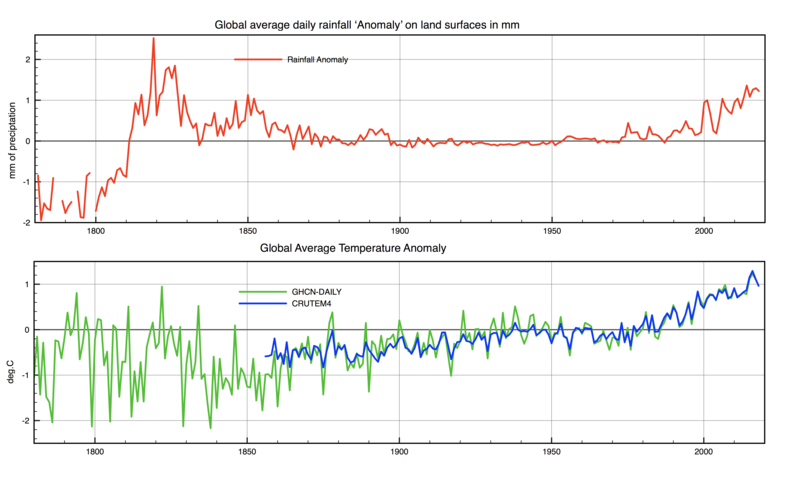 If global rainfall is a proxy for global temperature then the plots show that global records of both rainfall and temperature before 1865 are unreliable. As to correlation to volcanic activity, the steepest rise is 1810, five years prior toTambora. And 1815 seems to have a small drop before continuing the rise. If anything that seems to be Tambora’s footprint. The main news I see from Clive’s plots is that rainfall was amazingly stable for over a century, 1865-1975. This presumably being good data, brings into question the accuracy of global temperature record. It also makes puzzling the increased variability after 1975 and especially at 2000. I agree it looks strange. I am going to redo the calculation using only stations that self-consistently normalise with 1961-1990. This will reduce the number of stations to ~50,000, but that should be plenty. Using only stations which have normals defined between 1961-1990 hardly changes the result. The main bias in the 19th century is the concentration of stations in Europe. It seems Europe really was wetter. I will look into this. Wouldn’t 1 mm per day translate to 36.5 cm per year? That seems like a huge increase, at least for my spot on the globe. Am I getting something wrong? The terminology is confusing. It is the global average daily rainfall anomaly itself averaged over a full year. So what it really says is that this average value has increased by 1mm over the last 50y. So it is rather small. It is basically the same argument as used for average temperatures.